It was more than two years ago when Ashforth Company installed a charging station at 3001 Stamford Square. Well, that's no longer true as, just a few days ago, Mike McGee pulled his Toyota Prius Plug-In Hybrid in and plugged in the charger. It was a day worth celebrating for one of Connecticut's oldest charging station. That lonely, unused piece of electrical equipment is now in use daily. Hoorah!!! "I probably would not have thought about a hybrid car, but with the charging station located right at my office and Toyota’s $7300 rebate incentive, it was an easy decision." See? If you install it, they will come. 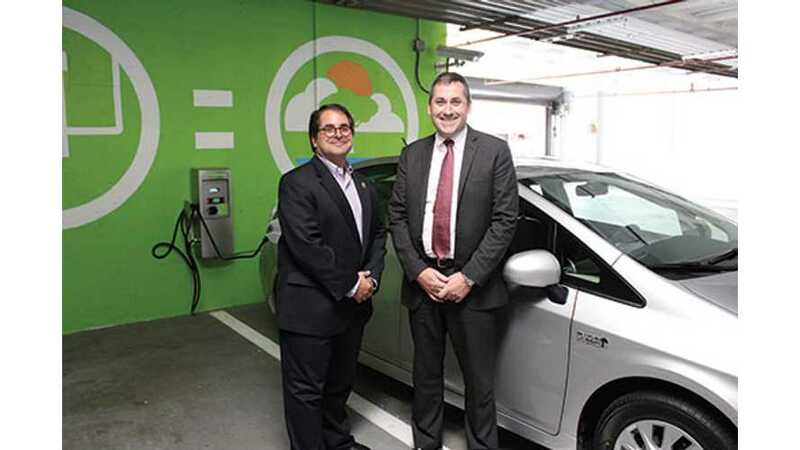 It has been over two years since The Ashforth Company installed a plug-in electric vehicle (EV) charging station at 3001 Stamford Square, Ashforth’s 290,000-square-foot office property located on Summer Street in Stamford, Conn. Installing the station in May of 2011 was a small part of the $12 million building renovation completed at the end of 2012. Ashforth’s charging station was one of the first private access electric charging units in Connecticut registered with the U.S. Department of Energy’s Alternative Fuels & Advanced Vehicles Data Center. According to the website late summer of 2011, (click here), there were approximately 65 public and private units registered in the state; 26 were private access units. Today the website notes 127 registered units with 108 of them indicated as private owners. Darien resident Mike McGee (above right), Managing Director at the Stamford office of KPMG, a tenant at Ashforth’s 3001 Stamford Square building is the first person to utilize the charging station according to the building’s Vice President and Property Manager, David Marks (above left). McGee recently purchased a 2013 Toyota Prius Plug-in Hybrid, which starts at $32,000. “We needed a second car and with the price of gas we wanted something more economical than our Toyota Highlander SUV. I probably would not have thought about a hybrid car, but with the charging station located right at my office and Toyota’s $7,300 rebate incentive, it was an easy decision,” said McGee. McGee noted that he can travel 13 miles on one charge and then the car automatically switches to regular gasoline. Ashforth’s Level 2 GE wall mount charging unit is located on a commission-designed wall in its parking garage allowing someone to simply park and plug their car to charge their EV. This is a free amenity to the tenants and their employees who work at Ashforth’s building. A typical Level 2 unit will charge an EV in 4-6 hours. However, McGee noted that it actually takes his car only about two to two and half hours to complete the charge at Ashforth’s station which is run off a dedicated 220 volt, 30 amp circuit. At home, since he plugs into a 110 volt, 15 amp circuit, it takes three to three and half hours. “We are excited to offer our tenants free and easy access to an electric charging station. We hope the on-site convenience will encourage more people to purchase electric vehicles as we can all ultimately benefit from a cleaner, lower-cost and locally available fuel alternative,” said Brian Heelan, Senior Vice President and Director of Operations for Ashforth’s management services division. 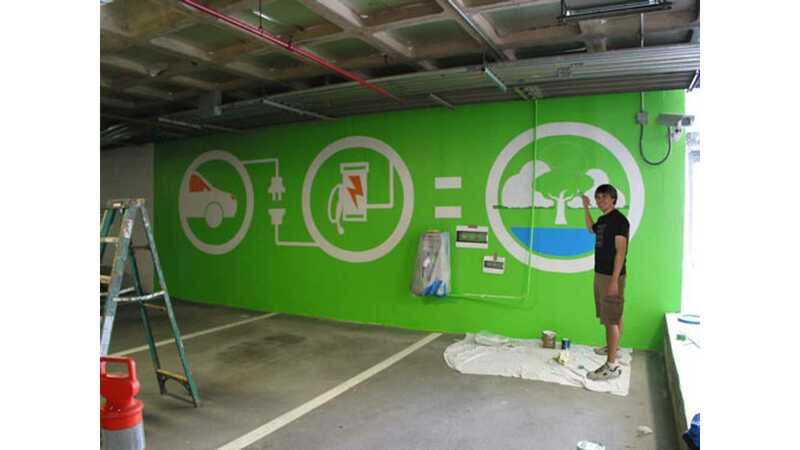 Ashforth commissioned Conor Heelan, former Bethel resident and recent graduate of Paier College of Art in Hamden, Conn., to produce and paint a full-scale mural on the wall where the wall mount charging station is located. The mural measures about 24 feet wide x 8 feet high. “I wanted to create a massive look that brings to light an environmental sustainability message as well as being stunningly eye-catching and fun for those who enter the building each day,” said Conor Heelan. Nearly 200,000 square feet of space is currently available for lease at 3001 Stamford Square. Designed by Roger Ferris + Partners of Westport, Conn., Ashforth’s $12 million completed renovation implements LEED construction standards and includes a striking, new modern lobby, state-of-the-art elevators, new bathrooms and tenant common areas, a new environmentally friendly and energy efficient HVAC system, enhanced landscaping, new property identity and directional signage, and contemporary facade enhancements. New amenities along with a private shuttle service are a full-service café and a modern, high-tech fitness facility.